Do you daily drive your Porsche? If you just can’t seem to hang up your Boxster keys in exchange for the family minivan, the Pasadena Porsche repair experts here at HOUSE Automotive definitely understand where you’re coming from. How else are you supposed to make that grueling Southern California commute bearable, anyway? Even though stop-and-go traffic is a bit of a pain, there are some notable advantages of putting highway miles on your Porsche as compared to doing strictly in-city driving. Wherever life’s adventures take you out on the open road, just know that your local Porsche repair specialists are here to make sure that you’re driving around safely…and in style. We believe that all of our valued customers in the Pasadena and surrounding Los Angeles area should have a Porsche that runs just as well as it shimmers in the sun. So, if you’re in need of a Porsche service center that you can trust in Beverly Hills and Pasadena, your search for “Porsche repair near me” ends today. Get in tune with our services, or feel free to reach out to our Porsche auto repair specialists with any questions about your vehicle. Now, in a rough comparison of highway driving and in-city driving, we’re going to take a brief look at how each driving setting affects the wear and tear on your Porsche. If you’re in the market to buy a used car – especially a used Porsche – mileage is an important factor to consider in your purchase. But it’s not just the numbers that count. Chances are, you’ve probably seen private sellers or dealers advertising certain vehicles with all-highway miles. Typically, highway miles are advertised as a positive selling point due to less wear and tear on the vehicle, and that’s a valid selling point because in-city miles and highway miles definitely have different effects on your car. Not only are you constantly stopping and going in the city (using more fuel than is otherwise necessary), but city driving also involves more potholes and rough roads, wreaking havoc on your suspension. Though you’re likely traveling at much higher speeds on the highway, your engine is working at a constant rate as opposed to frequently accelerating and braking. 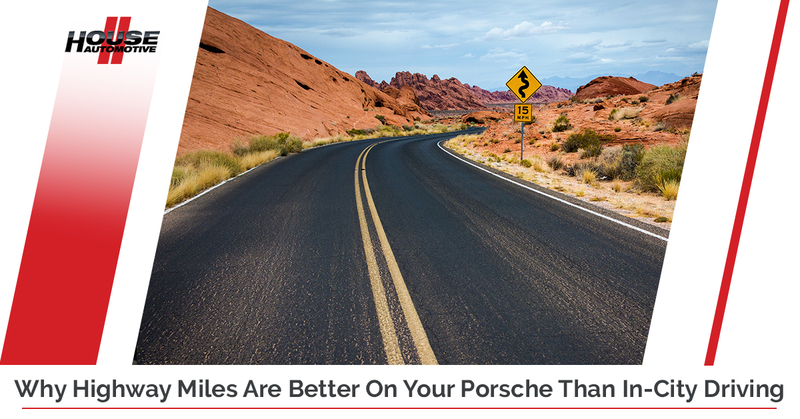 This means that highway miles are not only better on your fuel economy but they’re also easier on your brakes and transmission, two costly areas of Porsche repair. There’s nothing quite like flashing around your gorgeous Boxster or 911 Turbo in downtown LA, but you’ll encounter potential hazards in the city that you just won’t experience out on a road trip. When driving in a large city like Los Angeles, there are simply more cars on the road, meaning that there is more possibility of an accident. Parallel parking (a nightmare situation for many people) also presents its fair share of potential hazards from unwanted bumper damage to wheel curbing. Narrow parking spots may also lead to door dings, another costly repair job that’s avoidable by limiting in-city driving. Vandalism and theft are also things to consider if you’re frequently parking your Porsche in public parking lots or streets, so be mindful of where you’re parking or storing your vehicle. Now that we’ve briefly identified the distinctions between in-city miles and highway miles, you might be curious as to how you can tell which type of mileage a car has primarily experienced. Though it sounds obvious, one simple way to check is to take a look at the odometer. A fairly new car with unusually high mileage will usually be a highway vehicle – for instance, a one-year-old car with some 50,000 miles on it probably spent the vast majority of those miles cruising on the highway. Keep in mind that few drivers can travel that kind of distance in one year solely with stop-and-go traffic, unless they’re driving a taxi cab or a police vehicle. Another way to investigate the type of miles put on a given car is to take a good look at the condition of the body. Are there any noticeable dents or curb rash? What about scrapes? The more exterior paint or trim damage you notice, the more likely your prospective purchase was driven in-city. If you or a friend has been using their car as an Uber or Lyft taxi vehicle, you’ll probably notice an accelerated rate of wear and tear on the outside and the inside of the car. Of course, we wouldn’t recommend using your sporty Porsche just to shuttle people around town, but hey, that would be a pretty fun passenger ride! Of course, if you’re unsure about how many highway miles or in-city miles are on a given vehicle, you can always talk to a reputable mechanic. It’s advised that you visit a professional that specializes in working on that particular brand of vehicle, so if you’re in the market to purchase a used Porsche, it’s worth the time to bring it on down to our friendly Porsche service team. Whether you’ve owned your Porsche for decades or you’re looking into buying a certified-pre-owned model, HOUSE Automotive believes that every Porsche owner should drive around with pride and confidence in their ride. Ready to chat with our Beverly Hills Porsche repair experts? We’re here when you need us. Contact HOUSE Automotive today.